All through life one needs to make choices that require decision making. One of the most important, and perhaps, difficult decisions to make is about final disposition of one’s body. There are various pros and cons to both burial and cremation, as discussed further. Once decided, it is advisable to make your decision known to your loved ones in writing. This will ensure that your wishes are met when the time for it comes. Burial has been a traditional practice for centuries, if not millennia. Many years ago in the US, the body was wrapped in a shroud and lowered into a hand-dug grave. During the Civil War, however, it became necessary to preserve the body until it reached its home destination. This led to embalming as a common practice. Over the years, some environmental and health hazards became associated with embalming. Today it is considered to be unnecessary by some people, and there is a popular movement towards returning to natural burial.One of the main advantages to burial is the fact that families can be buried adjacent to each other in a family plot. Today’s society, however, is transient. Many people move away from the place of their childhood, either for career opportunities, or improved quality of life and the family grave site often remains unvisited. On the other hand, natural burial can be quite economical, while a traditional burial, with casket, embalming, and grave purchase, can be very expensive. 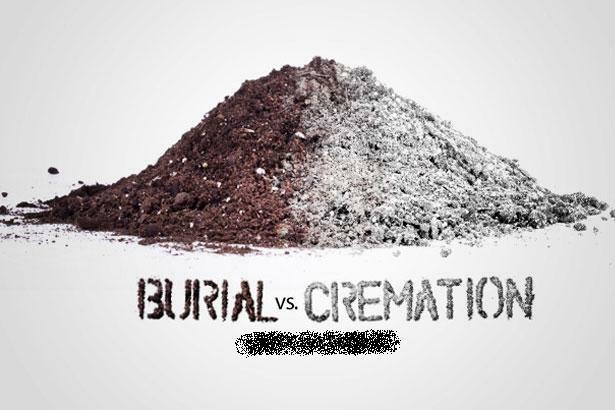 Cremation has been rapidly gaining popularity during the last decade. It currently accounts for more than 39% of all deaths in the United States, with much higher percentages in some regions. It is generally less expensive than a traditional burial and funeral as direct cremation can be found for under $1,000. For containment of ashes, the internet provides an overwhelming amount of cremation urns for sale. The variety of materials offer endless choices. Cremation urns, also referred to as burial urns, are available in ceramic, metal, glass, wood, fabric, and biodegradable materials. There are large urns so that the ashes can be kept intact. There are even companion urns, which are double-sized vessels. The companion urn is a good choice for a couple who wishes to remain together after the end of earthly life. Smaller urns or keepsake urns are ideal for someone who wishes to keep just a small amount of the ash. This points to an advantage of cremation over burial. The ashes can move with a family, or even be contained in jewellery, which enables one to keep a loved one close to the heart at all times. On the flip side, some people find cremation to be less than environmentally friendly. This continues to be debatable, especially with updated methods such as alkaline hydrolysis, which is a water- based chemical resolving process. Otherwise, cremation uses less space, space being the limiting constraint in areas nowadays. These points are the main factors to consider when making the decision between burial and cremation. There are also religious tenets to take into account, along with rising awareness on organ donation. Hence it is a very personal decision, that should be resolved with consideration and communicated to near and dear ones.